Remember the strawberry shortcake line hugging the niche gift vendor stands and vining out into the festival grounds? For good reason too, nothing beats the Strawberry Shortcake at this annual festival! 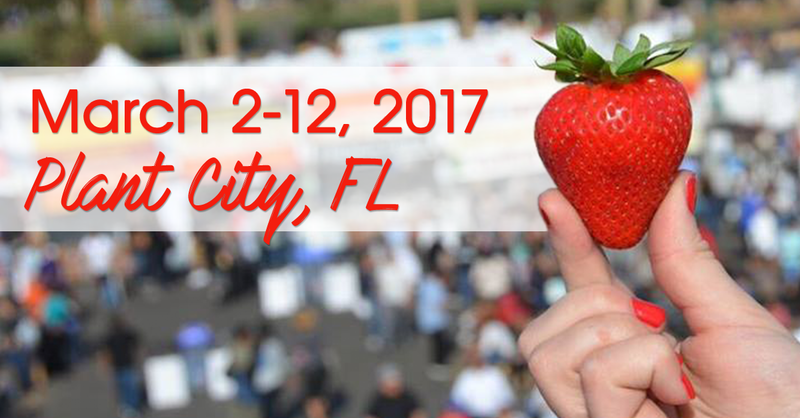 The 2017 Florida Strawberry Festival returns March 2-12 to Plant City, but it's not just about the strawberries. There is so much more! Since its commencement in 1930 by the Plant City Lions Club, the historical and agricultural legacies remain triumphant as seen through the abundant educational exhibits and the relentless volunteer spirit of Plant City locals. As a yearly pilgrimage, thousands of strawberry enthusiasts flock to sink their teeth into the endless goodies and amusements the Strawberry Festival offers such as concerts, eating contests, rides, and strawberries assembled every which way. Not a fan of strawberries? No worries because the festival delivers numerous delectable cuisines with a bountiful array of food and specialty treat vendors sure to pique your taste-buds! Looking for a good toe-tapper? From 3:30 p.m. and 7:30 p.m. each day on the Wish Farms Soundstage, the 2017 Strawberry Festival Concert Series hosts major artists for its concerts such as KING & COUNTRY, Willie Nelson, Little Big Town, and Rascal Flatts just to name a few. Follow the link for concert information about the performance dates of guest artists and concert ticket. Prices this year begin at $15. For those waiting last-minute to reserve their tickets, the festival allocates about 3,000 free seats in the Morrow Steel Free Grandstand on a first come, first-seated basis as part of your paid gate admission. Tickets for each show are on sale at the Amscot Main Ticket Office located at 2209 W. Oak Avenue in Plant City and over the phone at 813-754-1996. The festival gates open at 10 am daily and close at 10 pm; regular admission prices are: Adults (ages 13+) $10, Children (ages 6-12) $5, and Children (ages 5 and under) are Free. The Midway opens daily at noon except on Saturday, Sunday, and Monday when it opens at 10:00 a.m. Find information about the Strawberry Festival's 'Special Days & Discount Deals' and the 'Midway Discount Days' by clicking over to the 2017 Florida Strawberry Festival event page. So you want to go, of course you do, we ALL do! But you don’t want to exhaust yourself before you’re through the gates, hoofing it in from the great beyond, we recommend arrive early for this fest! A popular event, traffic backs up as the day goes on. Be sure to check out 2017 parking locations on the 2017 Strawberry Festival event page. 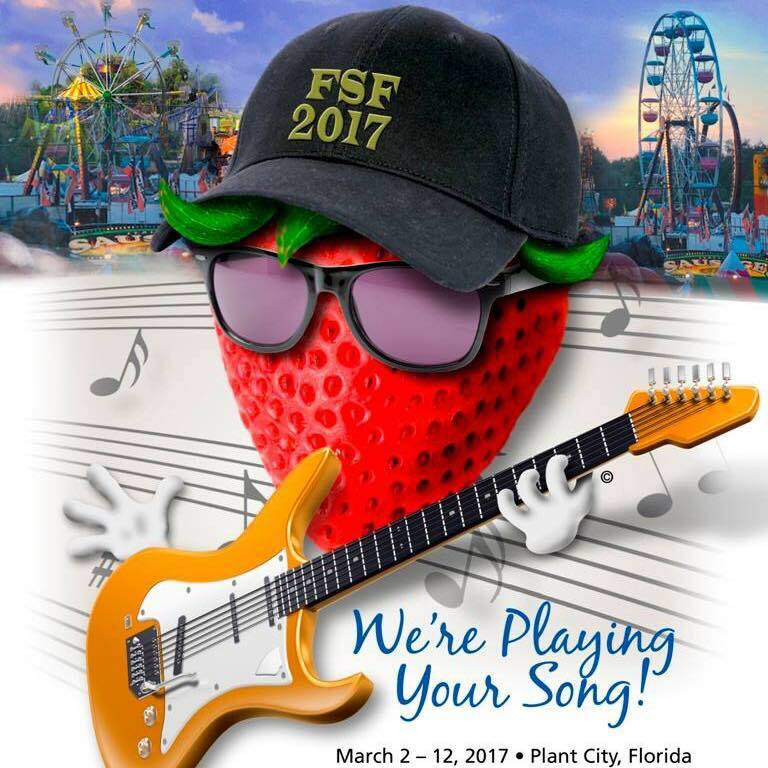 Simply click the link, and make your plans today for a spectacular time with your family and friends at the 2017 Florida Strawberry Festival, where it is indeed, not just about strawberries!